Using Pony object-relational mapper you can concentrate on writing business logic of your application and use Python syntax for interacting with the database. Pony translates such queries into SQL and executes them in the database in the most efficient way. You can start modeling your application right now. 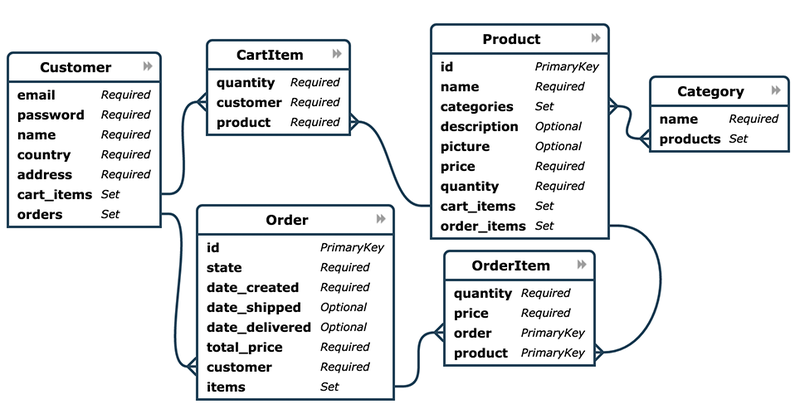 Once your data diagram is ready, you can start using it with Pony ORM or get SQL statements for creating tables. If you know Python you already know how to write queries with Pony. Pony is good for beginners due to its pythonic syntax. But besides this it also provides great performance due to smart caching. Pony now supports a native database JSON data type that enables efficient access to data in JSON format. Pony is by far the best SQL ORM for fast prototyping, thanks to its Entity-Relationship Diagram Editor and its pythonic style. It's my first choice when dealing with an SQL database oriented application. The learning curve is very lean and you can start using it really fast. It's certainly the most intuitive & Pythonistic approach to querying databases and is very similar to LINQ in that aspect. I use Pony in production. It allows me to create webapps much faster than any other ORM I've tried, and produces sensible, performant SQL both in production with Postgres and when testing with SQLite. PonyORM pythonic queries are just fun to work with. Of all the main ORM's out there, Pony is the one with the most intuitive interface, most of the time when you get one of those "I bet this should work" moments, it actually does! Easy to set up, easy to work with, it even has a great Entity Relationship Diagram editor that throws out the code you'll need to start your project. I really recommend you try PonyORM on your next project. I think that Pony ORM is the best ORM in terms of convenience and ease of use. Currently I'm working on developing an ORM for Nim language (nim-lang.org) and I get a lot of inspiration from Pony. I choose Pony ORM for its performance and ability to write clear and concise code using domain-specific language (DSL). The absence of DSL in SQLAlchemy was the main reason I was looking for an alternative to it, because without using DSL the code looks heavy and cumbersome. I like Pony ORM for it being intuitive. First queries I wrote without reading the documentation, and it was crucial for me in the beginning. When I started working on my project I didn't have experience neither with Python, nor with Pony. Later I used documentation, which covered all questions that I had. Pony ORM is a great software. Its integration with the Python language using generator expression is superb and makes it easy to write queries using known syntax instead of using a new language. Coming from C#/LINQ world I find it very intuitive, powerful and nice to use, so any C# developer coming to Python should definitely try this. Pony is great! Because of using the advantages of Python comprehensive. At all I like it very much. At this point in time, I wouldn't even consider using a different ORM for projects. We have been using Pony ORM in our projects for several years. The query syntax is very intuitive which makes writing the business logic really an easy task. The sub-collections is a real gem! Especially when using the attribute lifting feature and collection sorting. Join us on Telegram. Meet the PonyORM team, chat with the community members, and get your questions answered on our community Telegram group. Post your PonyORM questions on Stack Overflow. Report an issue. Submit bug reports, suggest new features, or follow development on our GitHub repo. Check the messages from our mail list archive.